TC900E is a state-of-the-art electronic temperature controller designed for refrigeration applications with enhanced energy saving and safety features. 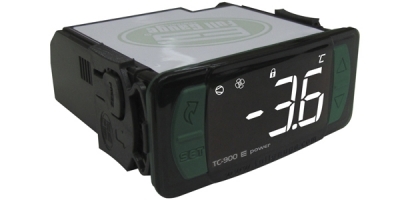 TC-900E Power is equipped with three relay outputs, two temperature sensors and two programmable digital inputs. A provision of third temperature sensor allows defrost management of two evaporators in one room. Third temperature sensor can also be used for condenser temperature control to protect the system from high condensing temperatures. The two digital inputs can be programmed to auto activate economic set point during night or light load conditions, initiate defrost, fast freezing mode, pressure or door alarms etc. A quick access key allows quick access to key parameters. Other salient features include temperature initiated defrost, internal buzzer, IP65 frontal, drip protection case on rear, min-max temperature record, serial programming key, multi LED colors and functions lockdown to prevent unauthorized parameter changes. 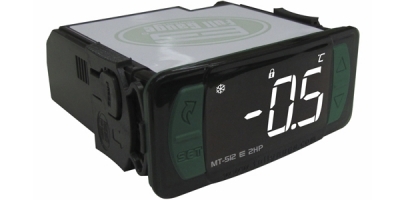 MT512E 2HP is a state-of-the-art Digital Temperature Controller designed for refrigeration applications with enhanced safety features. MT512E 2hp is equipped with one 16A relay, one temperature sensors and cyclic timer for Natural Defrost. * Use SB59 temperature sensor for 200°C controller supplied with standards sensor -50 to 105^Ctemperature range. 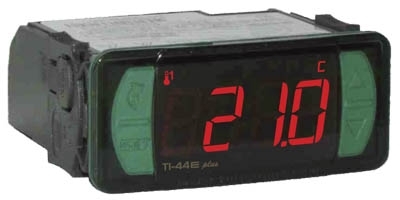 TI-44E is a temperature indicator designed to monitor average, differential or individual temperatures of up-to four sensors. It can be connected to Sitrad real-time monitoring and management software or Smartphone app via RS485 serial communication port. It features IP65 frontal protection, drip protection case at rear, temper-proof function lock down to prevent unauthorized change of parameters.